Lately I have been doing a lot of pacing in front of my closet, trying to figure out what to wear. I tend to get like this once the fun new-ness of the season wears off. All of a sudden I have "nothing to wear", a closet full on options that no longer seem quite appropriate. While I'm always a fan of a cozy sweater, I don't like the idea of falling into that comfortable rut. As a result I have been gravitating towards dressier pieces. I found this sleeveless silk top on sale (for a steal) at J. Crew the week before last and haven't stopped thinking up ways to wear it since. It's amazing what a little something new can do. 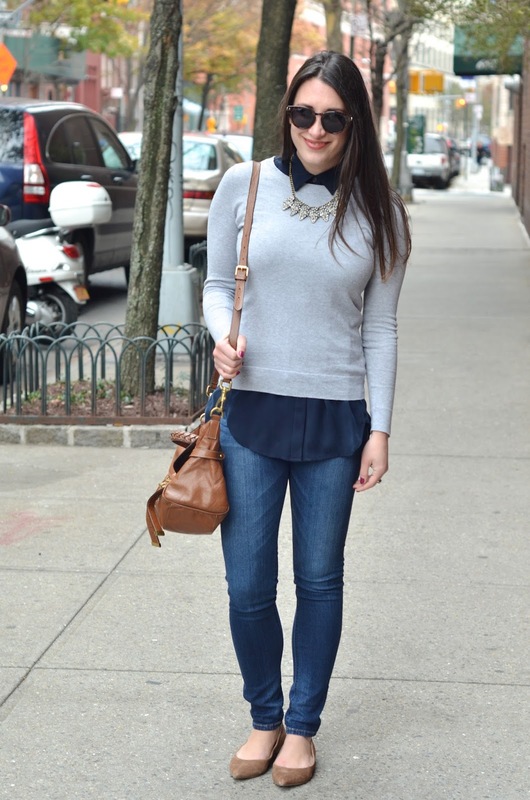 This time I went for a preppy look with a gray sweater, sparkly necklace, and pointed toe flats. I absolutely love how you layered this! Perfection! And LOOOOVE that jacket! So pretty! I feel your pain. It's cold out (other than today) but it's not freezing. Much like every girl, I'm sure you have a ton in that closet. It seems that you were able to pull out something adorable. I like the little touch of sparkle. Love the idea of using a sleeveless collared top to create this look! Lessens the bulk dramatically, especially when it is not FREEZING yet. Great idea! Absolutely love this look and I love how the bottom peeks through the sweater at the bottom!! I think you've done the prepsters proud!! Such a pretty look! Love that! This look is so perfect. You look effortlessly pulled together. I am completely the same way about my existing closet but find that just one or two new pieces can make everything better. So of course this weekend that meant a new flannel shirt, a new basic black sweater, and the cutest new coat (all for insane deals! love holiday shopping). Hopefully all this helps me avoid an oversized sweater rut! What a great fall outfit! 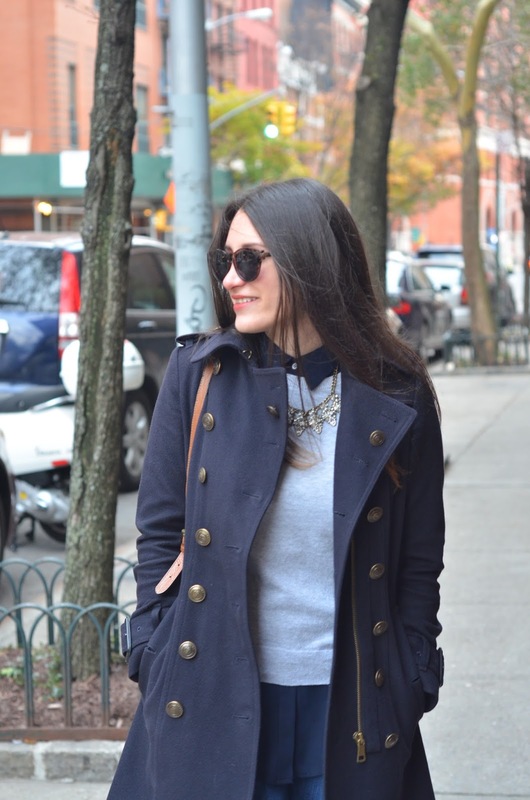 So impressed that you are able to resist the temptation of cozy fall sweaters, I am inspired! Love the mix of navy and grey. Love this look! Gray and navy is one of my favorite color combos! 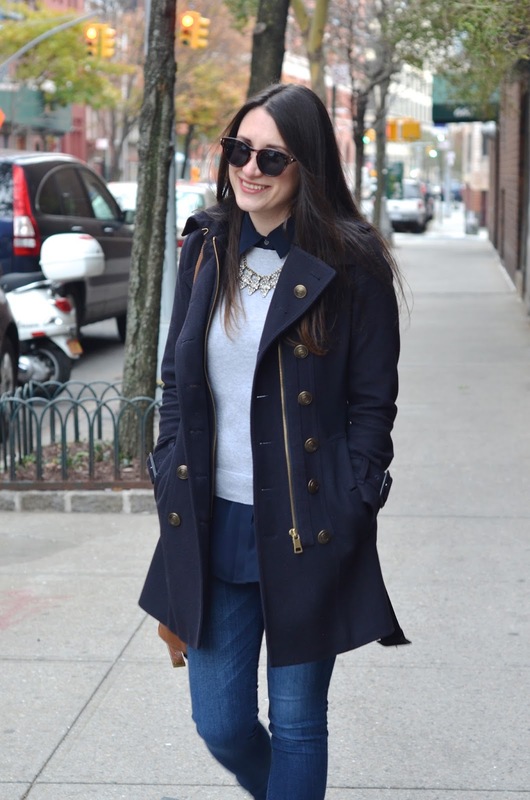 LOVE that statement necklace paired over the sweater and collared shirt! Perfection! I love your coat, the navy blue is so unique, you don't see many coats in this color. I think it is a second choice over black! 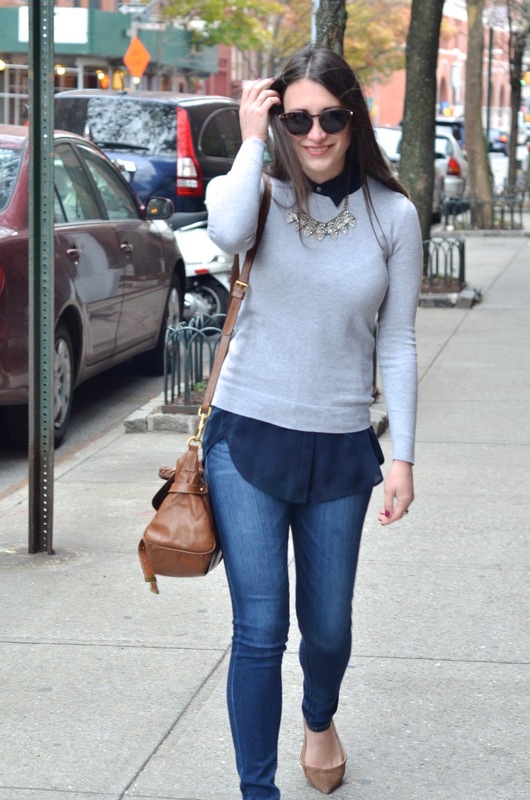 Great pairings with your simple sweater and statement necklace. So classic chic! Love this look from head to toe! Ooo I love the necklace!! 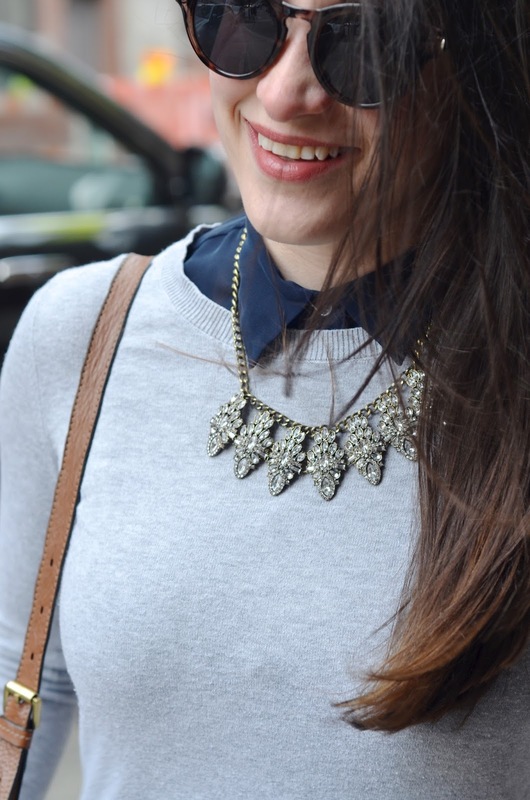 This is such a classic chic look and I love your necklace! Love how you layered the sweater over the shirt! So cute! Ughh I have been feeling like I have nothing to wear too. I am just not digging the cool temps right now. Love love that necklace! I absolutely love this look - so cute!